“The story starts with the legendary country picker Clarence White and a very worn, battered 1935 D-28 the young White found in a music store in desperate need of attention. The guitar was in a terrible state of repair, was missing a fretboard and had undergone a series of modifications. The top had been sanded thin and the neck shaved. The owner previous to Clarence had played the guitar sufficiently hard to wear away patches of wood around the sound hole, and attempted to improve the appearance of the guitar by enlarging the sound hole so that the damaged wood was removed. “Still, it was a D-28 at a price Clarence could afford, and he purchased the guitar and entrusted it to a repairer who fitted a Gretsch fret board and attended to various cracks. 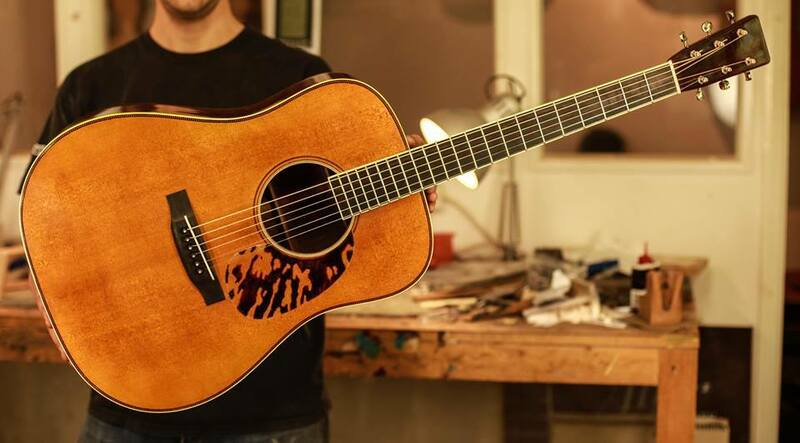 White was advised not to fit heavy gauge strings to it due to the sanded top being too thin to support them, advice that was swiftly ignored and the guitar was soon back for more repairs to the soundboard. For the early part of the 60s Clarence played the D-28, until frustrations with its declining playability led to it largely being replaced by a newer D-18. The guitar certainly continued to live a colourful life in Clarence’s hands, including getting shot with a BB gun and narrowly surviving a run-in with a truck, before eventually being used as collateral on a loan in 1965 and never reclaimed.